You are here: Home » Want to find out Who Called Us? Are you annoyed by those calls from 1-800-number missed calls when you come back from work and wondered ‘Who called us?’. Wonder no more. There really is a website named Who Called Us where you can enter the number you want to look up. It is also interesting to see the most frequently reported/called numbers and most called states as well. California sits at the top of the list there. For any particular number, you can see all the comments for that particular number a map overlay of how the calls are spread out throughout the US. You could not only figure out who called you, also most often what they wanted from the comments. The lookup is not limited to just 800 numbers as a lot of marketing people these days use regular numbers as well. Next time you wonder about the number on your caller ID, you know you’ll use this bookmark. I will have to try to look it up, though I don’t think that number will be found. Living in Iowa, we are getting harrassed about the presidential debate thing, so I can’t help but think it is related to that. Is this service available only in US? @Aseem.. you are welcome! Hope you find who’s calling! @Nirmal.. I’m afraid so. I should mention this in the post from now on if the service is geographically limited. 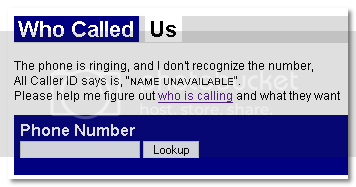 That is a very interesting site, especially for callers trying to hide their identity. There’s another that is similar called 800notes.com. I’m not related to it, I just work with toll free numbers and refer to it too. Bill, thanks for stopping by and taking the time to comment. 800notes.com looks good too. Maybe I’ll update this post with a reference to it. Cheeers! Site is and has been unavailable since 2-8-08. Anyone know why? I just went to it and it’s working. Hi Carol, I just tried and the site seems to be up. The url is easy to mistype and it is whocalled.us. You probably have that right but just thought I’d mention. Good site! Also check out http://www.yourcallerid.com. They also have reports of annoying phone calls! I love lookup up phone number I can find any info on anyone.